Robert Sorby is known as an innovator in quality and has, in the main, trail blazed rather than followed. That said, whilst others around them have been making interchangeable tool handles Robert Sorby has been quietly working away on other projects - until now. The Sovereign tool handle system is available in 405mm (16in) and 560mm (22in) long units, which can be extended with the aid of a threaded coupler. The handles sport knurled detailing, and 15mm (5/8in) internal bore, which will accept blades of different diameters through the aid of collets. Two machine screws clamp the blades in place - and here is where there is great attention to detail - as these are brass tipped so as not to mar the blades, along with brass tipped grub screws. 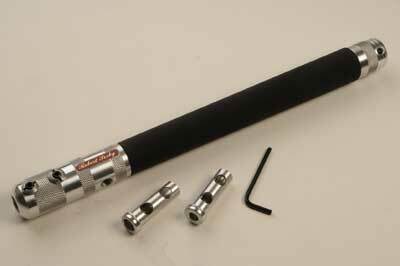 The high-density material coated handle is comfortable to hold and touch and ensures a good grip at all times. The styling of the handle is one of the best I've seen and the detail here is synonymous with many other products Robert Sorby has released. The little added touches like an optional counterweight - handy when deep hollowing - and a side handle - again, useful when hollowing - take what would be an otherwise stylish and well thought out handle into another league entirely. The handles represent good value for money, do exactly what they promise and will allow you to accessorise as necessary to suit your turning style and requirements. 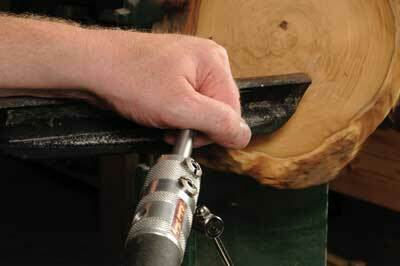 As such, these handles are well worth exploring as options for your workshop. Also available is a wide range of blades to fit the Sovereign handles as well as a number of optional extras to help enhance the handle system.